This was my first ever review at The Place, one of London’s major dance venues. I had, of course, been there before, but this was also my first experience of their annual Resolution! festival, which showcases three new works every night for a month, between mid-January and mid-February every year. It’s a great place for up-and-coming choreographers, dancers and dance companies alike to share their work in a supportive atmosphere and get feedback on their work. The Place also run a Resolution! reviewers scheme, during which a team of aspiring reviewers and dance writers have the opportunity to write regular reviews and receive feedback from professionals in the industry. Two reviewers see each show, and their reviews are published the following day on The Place’s website. There are 8 reviewers involved this year, mentored by several of the big names of dance writing from The Guardian and The Times, to mention but a few. Suse Tietjen, Lucy Palmer Dance, Ishaan De Banya and Kenny Wing Tao Ho end the first week of Resolution! 2014 with a huge following of fans in the audience. The Place have been running their Resolution! 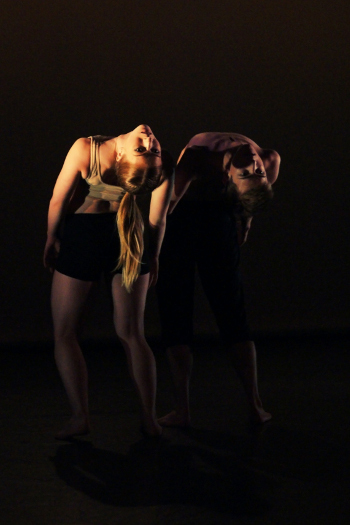 festival of performance by young upcoming choreographers for 25 years. Since 1990, hundreds of choreographers have graced the stage with unknown works that have never been seen before. Some huge names began here: Russell Maliphant and Hofesh Shechter showcased works here in 1992 and 2004 respectively.